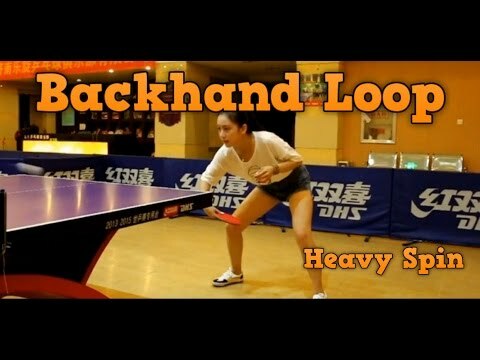 Backhand loop against underspin ball is the basic technique in table tennis that every beginner should master. Coach EmRatThich explains the best 3 tips to improve your backhand skills. There are in general 9 important backhand techniques that you should know. How to backhand loop off push? The first step: Lower your center of gravity, and lead your body forward, fold your abdomen. Many players forget this step, and they just stand up straight, so can’t add enough power to lift the underspin ball. The second step: Keep your elbow high, and drop your racket down lower than the table. Many of you do the wrong technique, that you drop your elbow and your racket at the same time. No! Don’t do that. The elbow is the rotation axis if you drop your elbow low, how can you use the elbow to lift the ball? This is the common error of many amateur table tennis player. Please fix your elbow, don’t move it. You can fold your back to adjust to the ball but keep your elbow high. The final step: Close your racket about 45 degrees. Wait for the ball at its highest position on the bounce. And then accelerate and brush the ball. The main force comes from the elbow. You can also use your back to add the power to your Backhand loop. To do that, stand up your body and rotate the elbow at the same time, and then hit the ball. Some players can’t backhand loop because they don’t know how to add power to the stroke. They drop the elbow too low, and they can’t rotate to lift the ball. If you film yourself, you will see that you don’t rotate the elbow enough, but just stand up too straight, and you hit the ball too soon. If you loop the ball to the net, just wait for a little, and hit the ball later. If you loop the ball out of the table, that means the ball doesn’t have enough spin, so accelerate the ball faster. To backhand loop correctly, you need to fold your abdomen. This action will help you to put the elbow high and forward. The elbow is the main rotation axis to lift the ball. To add the power to the stroke. You need to use all of the body: the back, the hip, and the leg. The muscle around the elbow is not strong enough, so use the force from the ground to accelerate and hit the ball. To lift the underspin ball, you need to accelerate into the ball. To do that, relax your wrist, hold your racket loosely, and suddenly rotate and lift the ball. Remember: It’s like the way the cowboy whips off the horse. Relax and Whip! A related article, learn Ma Long’s backhand technique to loop the heavy underspin ball. Another option to deal with the topspin ball on your backhand side is to do the new “Boomerang flick”. Thanks. I tried it and able to cause some upsets to other players. Hold the racket loosely first and whip it. BTW, the comments in other post is hidden? hi Le. Thank you. I don’t know why the comment is hidden. Maybe it’s due to the update of WordPress?